In general, when providing instructions on how to get somewhere, people generally include landmarks in their instructions - “Turn left just after the playground and then continue past the traffic lights“. In widely used online routing services however, all instructions use the distance and direction format - “After 200m turn left, and then continue forwards for 400m”. As many people are not particularly accurate when judging distances travelled, this distance based method can often lead to missed turns or a general sense of unsurity. On the other hand, landmarks provide concrete features in the environment that are used to determine when to turn, and so the need for judging distance is reduced. Landmarks are different from just POIs, as they need to provide salient visual, structural or semantic cues the traveller can recognise easily. How to compute those from OSM has been explained in the paper. 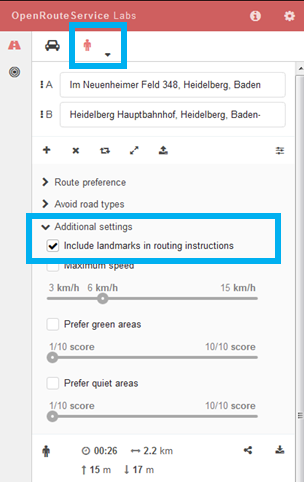 The inclusion of landmarks in pedestrian routing instructions is now available online for all of Germany in LABS.openrouteservice.org for evaluation purposes. The Landmark Service is currently available for all of Europe, but LABS supports only routing in Germany for testing purposes. Let us know what you think and where you want to see it or how to improve it. A part of the research leading to these results has received funding from the European Community’s Seventh Framework Programme (FP7/2007-2013) under Grant Agreement No. 612096 (CAP4Access). 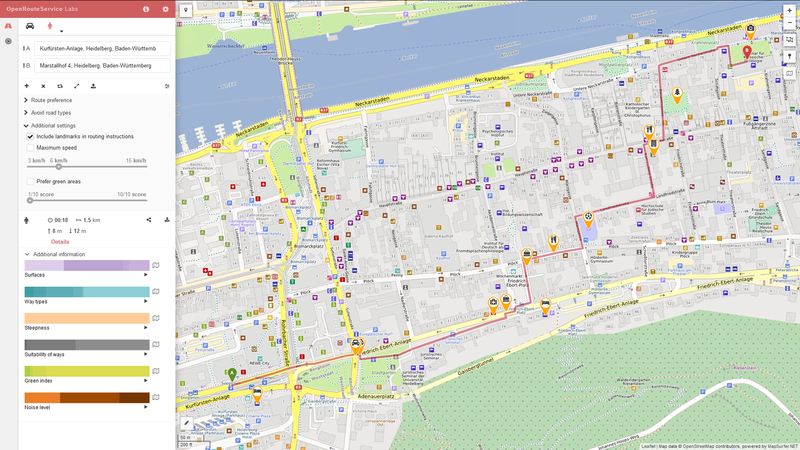 OpenRouteService supported by HeiGIT, core-funded by the Klaus Tschira Foundation, KTS, Heidelberg. Schmitz S, A Zipf, P Neis (2008): New applications based on collaborative geodata—the case of routing. Proceedings of XXVIII INCA International Congress on Collaborative Mapping and Space Technology. Gandhinagar, Gujarat, India.